Product #16532 | SKU DMXP01 | 0.0 (no ratings yet) Thanks for your rating! The Sony DMX-P01 is a professional digital field mixer that combines the convenience of portable studio grade audio mixing, with the pristine fidelity of high resolution digital technology. The mixer features 4 electronically balanced XLR inputs that are switchable between mic and line level signal. The output section also features 2 XLR outputs that are capable of providing mic or line level signal as well. The mixer features 24-bit A/D and D/A convertors and 32-bit signal processing. The DMXP-01 also supports both, 48kHz and 96kHz sampling frequencies. AES/EBU and S/PDIF outputs are provided, a second S/PDIF input can be used to cascade additional mixers. Channels 1/2 and 3/4 feature stereo linking, phase reverse switches on channels 2 and 4 allow M-S stereo decoding. Preset user locations are provided for storing parameter settings, providing quick recall of settings required by different users. The backlit LCD display features a choice of metering modes. VU, BBC-type, DIN-type, NORDIC-type, IEC-type 1 and dBFS metering are all user selectable. Low-cut filters and peak limiters are all user programmable and +48V phantom power is user switchable. The mixer is powered for approximately 5 hours with 8 AA batteries, external DC power is achieved via 4-pin XLR or DC power inputs. 24 bit A/D and D/A convertors ensure a high level of signal reproduction with emphasis on dynamics in respect to the source signal. 32 bit processing maximises DSP efficiency resulting in quick, accurate audio signal processing and throughput. 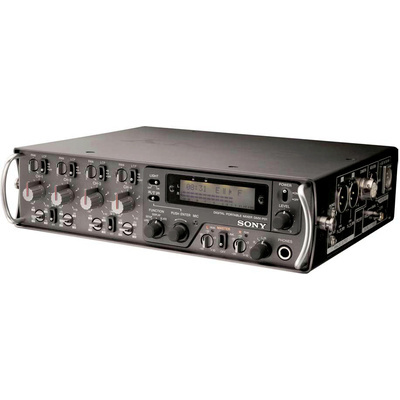 The DMXP-01 supports 48kHz and 96kHz sampling frequencies. High sampling frequencies result in pristine clarity and accurate signal detail. The mixer's 4 inputs feature stereo linking on channels 1/2 and 3/4. Phase reverse switches are provided on channels 2 and 4 for M-S decoding. The DMXP-01 is software driven, enabling users to store and recall programmed settings as needed. Software driven interface provides VU, BBC-type, DIN-type, NORDIC-type, IEC-type 1 and dBFS metering. The output section features AES/EBU digital and S/PDIF digital outputs, in addition to dual XLR analogue. The headphone monitor section provides six monitoring modes. Left output, right output, stereo output, left/right-mixed, mono, M/S decode and camera return.